On peaceful beachfront at Jasri, Aashaya Jasri Resort is one the loveliest midrange village-like hotels in East Bali. Aashaya Jasri oozes classical understated elegance with a relaxed atmosphere and style. A range of rooms in five traditional buildings, all with modern comforts, are well spread out around a gorgeous manicured lawn that leads to the sea. Ad Book now! Rates from US$66.5++. Average rating 9 from 12 reviews. At the rear of the property, a two-storey thatched teak lumbung is the largest of the traditional houses. Downstairs two twin rooms have separate access, and upstairs, accessed through a communal lounge, a twin and a triple room. Alongside the swimming pool, the second largest building has two separate rooms — a triple and a single. The triple room has a screened area for one of the beds, making it ideal for a family. The three other rooms are doubles, our favourite being the one closest to the ocean where you can lay in bed and listen to the waves — yes please! The rocky beach is located directly across a small, quiet road and as in most of this area, too rough for swimming — perhaps a paddle for the more adventurous at the right tide. The hotel staff should be able to advise you. 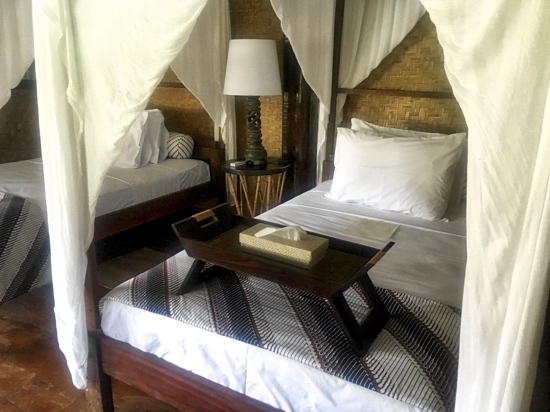 Rooms throughout the hotel have private hot-water ensuite bathrooms, ceiling fans, air-con and mosquito nets. 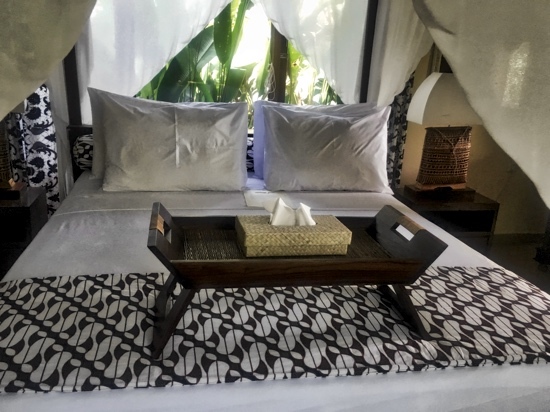 Classic Bali styling varies from room to room, but all feature traditional textures and textiles — think rattan, bamboo, batik and teakwood. Every detail is considered and done well — it feels very authentic. Beds are mostly four-poster and are super comfortable, with beautiful quality linens. Our only criticism is that the single beds seem narrow. Rooms are bright and breezy and spotlessly clean with a wonderful sense of space, even in the smaller rooms. The small clean swimming pool is fine for idling about in — who wants to do laps anyway? Sun-lounges, umbrellas and a small bale provide shade and a place to unwind. The spa is positioned right at the oceanfront so you can breathe the sea air while being pampered. A large open bale houses the popular restaurant, which is open to the public. WiFi and breakfast is included. The hotel has a no-smoking policy. 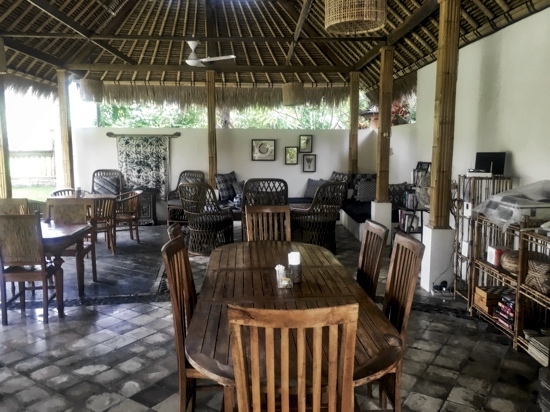 Aashaya Jasri Resort is a real treat for those looking for a tranquil escape to real Bali from the more frenzied tourist areas. It’s great for families with several mix-and-match room options, a romantic escape for couples and the one single room means solo travellers who are after a bit of luxury don’t have to pay for two. The food is good, too. 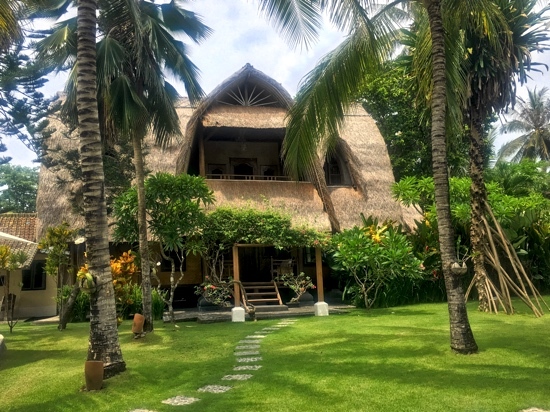 Aashaya Jasri Resort was formally Irene’s Homestay; plenty of signposts all over East Bali will lead you there. Last updated on 23rd February, 2016. Check rates at Aashaya Jasri on Booking.com. Room: Standard double room, low season: US$85, high season US$100. Notes: Up to $110/$115.